My trundling through the leadership literature for the first of my D.Min classes continues, as does my continuing to subject you to the reflections that will ultimately get cut-and-pasted into the papers I write for the course. The book I finished yesterday was Church Leadership (Revised Edition), by Lovett H. Weems, Jr.
Dr. Weems will be teaching the first of the courses I'll be taking in May at Wesley Theological Seminary, and let me preface my reflections by saying that this book was the most brilliant, powerful, and transformative work of radiant genius that I have ever been blessed to read. I laughed, I cried, it became a part of me. Seriously, though, and much to my great relief, the book wasn't half bad. It's a good general survey of leadership concepts, both from the for-profit and nonprofit worlds. 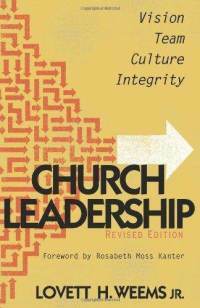 Unlike my recent readings in Heifetz/Linsky and Meyerson, though, there's an intentional...and mostly successful...effort to translate leadership concepts into a congregational context. That framing, in and of itself, makes the book more overtly relevant to my calling. In my reflections on this book, several key concepts popped for me. The Need for Leadership: The phrase "No organization can function without leadership," (Church Leadership, xix) popped up early in the preface, as Weems laid out what should be the pretty straightforward premise of the book. That should be straightforward, but these days, nothing is straightforward. There is, within both academic and related seminary circles, a significant countervailing meme that suggests that leaderless organizations are the wave of the future. Organizations with leaders are assumed to be hierarchical/patriarchal, inherently oppressive of the generative creativity that occurs in a more "flat" organization. This is Leadership 2.0. It is postmodern. It is emergent. It's "starfish" organizations rather than "spider" organizations, to use the terminology from Brafman and Beckstrom's influential book. In a "starfish" organization, the idea is that the whole organization exists in every part, and from every part the whole can reproduce itself. "Spiders" are hierarchical, rigid, inflexible, and easily crunched. Or so that idea goes. In my own experience, though, I've found that the idea of leaderless organizations founders on the shoals of reality. It jes' don't get 'er done. Case in point: Presbymergent. A few years back, I found myself caught up in emergent conversations within the PC(USA), mostly because I: 1) compulsively blog; 2) am of an essentially progressive and inclusive persuasion; and 3) tend towards owning Apple products, to the point of seeming almost a bit DSM-V certifiable. As energy levels and enthusiasm rose, a gathering of Mac Using Emergents was planned for Louisville, where the movement was to coalesce and exciting new things were to begin. Things started out fine. Though I felt socially on the periphery of the group, folks were cool, and conversation was invigorating, and the glowing Apples on the backs of our MacBooks hummed in a circle of Steve Jobs synergy. But when it came time to plan, suddenly, we became the starfish. No-one felt it was appropriate to take on the mantle of leadership, because we were, like, being the starfish, dude. An "organizational plan" was proposed that started out well enough, but it ended as basically an amorphous blob layered on top of a radiant chaos symbol. Everyone was the leader. And when everyone is the leader...no-one is. With this incoherent decisionmaking structure, I and a few other structurally inclined souls volunteered to try to create legal articles of incorporation so we could get funding. It wasn't possible. Not without lying, which is never a good thing to do in legal documents. Even if we had gotten them past the draft stage...who would have approved them? No-one knew. In the absence of clear leadership and the vision and direction that would have provided, the various subgroups spun out into nothing within six months. What energy was present...and there was energy and real potential...disappated. It was frustrating. But not surprising. Without leadership, groups of like-minded friends can bumble along nicely. But no organization can function. Defining the Heroic Model of Leadership: In exploring congregational leadership, Weems touches on the idea of moving away from the heroic model (Weems, p. 72), which he describes as self-defeating. (ibid, p. 73) There is significant truth in that, which he illustrates effectively. Pastors can make themselves the functional center of an organization, doing everything and deciding everything because only they know how to do it right. Even if a pastor is truly gifted, this leaves communities radically dependent on their pastors, and fails to equip the church by illuminating the gifts of the laity. (ibid., p.74) It is a major concern, particularly as well-meaning but overfunctioning pastors steamroll lay leadership into irrelevance. In defining "heroic leadership" as a style, Weems suggests that it has the following characteristics: "The leader parcels out work, sets objectives, monitors performance, and fixes whatever is wrong." (p. 73) This is certainly controlling and perfectionist, but not "heroic," at least not as I understand heroism. Heroic leadership is not smotheringly matriarchal. When I think "hero," I think of unusual strength, unusual integrity, and unusual courage. I think of an individual whose essential character and grace make them worthy of respect. If you're the leader, you can't be a schlemiel. Or a putz. No one is perfect, of course. But effective leadership requires exceptional integrity, up to and including a willingness to simultaneously admit imperfection in the face of community expectations and defy it inwardly. It's perhaps the most significant challenge anyone called to lead faces. Lord knows I feel that weight.